You have probably seen someone use a rollator transport chair without knowing it. These combination walkers/transport wheelchairs resemble a standard walk-behind rollator. Flip over the walker seat into a transport chair seat in situations where you need to rest and have a friend or aide push the wheelchair instead. A wheelchair and rolling walker (also known as a rollator transport chair) serve the needs of elderly and others who have mobility problems. Use it as a transport wheelchair or convert it to a rolling walker. A rollator saves you time and energy by allowing you to roll the walker instead of lifting it when you need to take a step. A transport wheelchair lets you sit while a relative or caregiver pushes the chair. Portable and lightweight, you can fold and store the rollator chair in any vehicle after use. Some walker/transport chair hybrids come with storage bags for easier check-in at the airport. Do You Need a Rollator Transport Chair? A combination transport chair and rollator allows elderly users and their families enjoy traveling. Instead of dealing with bulky wheelchairs, or waiting for a rollator user to “catch his or her breath” on extended trips, you can transform the rollator into a chair and vice-versa. Visit parks, museums or other points of interest without missing out on activities and keep pace with your travel companions. People recovering from surgery or an injury can benefit from using a rollator transport chair. You can use the transport chair until you become strong enough to graduate to the rollator. You’ll also save money and avoid spending money for two mobility items during your recovery. Permanently disabled people and elderly individuals who are too weak to walk should use a conventional or transport wheelchair. A rollator without a transport chair gives vulnerable or older adults more support than a cane and helps them move faster than a standard walker. A rollator helps you remain active and gives you much more flexibility than a cane or walker. You won’t need to use tools to change the walker to a transport chair. Move the locking flip-down footrests and flip-up armrests to turn the rollator into a transport chair. The castors (front tires) allow the rollator to move with ease on indoor and outdoor surfaces. A smaller castor gives you better agility and foot clearance but may cause a bumpy ride or forward falls. You may want to choose a rollator transport chair with eight-inch castors (or larger) if you do a lot of traveling outdoors or plan to go for daily walks in the park or forest preserve. For outdoor use, your wheels should have a have a knobby medium tread for better traction. For indoor use, a smooth, skinny tire with light treads provides better mobility. 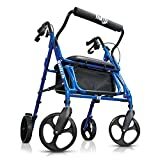 Find a unit with wheels appropriate for your daily activities. A rollator transport chair gives you more freedom than a wheelchair or walker If you’re recovering from an illness or injury. Older adults who still want to remain active, but lack the energy and speed of the past will also benefit from using a rollator transport chair. When deciding which model to buy, follow the same measurement rules you use for a standalone transport wheelchair. Factor in how often you’ll use the device, and what accessories are needed. Use these guidelines when measuring yourself (or the rollator/transport wheelchair user) to assure maximum comfort. When it comes to rollator combo chairs, there’s no shortage of sturdy, well-built models available on the market. We have five top picks that we recommend to anyone who is thinking about investing in a rollator combo chair. Out of 592 Amazon reviews, this rollator/transport chair received 60% 5-Star and 21% 4-Star reviews. With a weight capacity of 300 pounds, this durable aluminum unit provides you with a safer ride due, in part, to the unit’s solid eight-inch casters. This rollator/chair has large eight-inch casters to function indoors and outdoors. It rolls over bumps, elevator entrances and carpet joints with less friction than units with smaller wheels. The Drive Medical Duet comes with a carry pouch to give you better security for your cell phone and other personal items. You won’t need to buy additional seat cushions for more comfort during long trips. The manufacturer has included a contoured padded backrest and padded seat as standard with this unit. You can store the arms with the safety lock release, and use the loop fastener strap to store the footrest after you convert to the rollator. 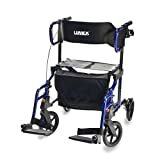 The lock-out feature on this rollator transport chair’ s folding frame keeps the unit open while you use it and keeps it tightly folded while traveling indoors or outdoors. The few negative reviews for this product cite problems with loose front wheels, and a tendency for the chair to tip over when guided over uneven outdoor surfaces. This rollator transport chair has a limited lifetime warranty to give you peace of mind should a part wear out or break. 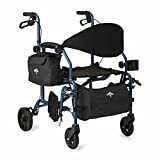 A user-friendly mobility device, the Medline Combination Rollator Transport Chair has a 70% 5-star rating on Amazon.com. Reviewers on the site appreciate its ease of conversion, storage pouches, and back support. The adjustable push grips make it easier for you (or your family member) to steer the chair. With a castor size of six inches and rear wheels measuring seven inches, this rollator transport chair manages indoor areas well and gives you an adequate outdoor ride. You may want to choose another unit with larger wheels if you primarily travel outdoors on bumpy terrain. Enjoy eating meals or working at your computer without struggling, as the restaurant-style armrests fit under tables or desks. You won’t need to buy many accessories for this unit, as it already has a cup holder, carrying case and under-seat basket for carrying personal items. It sports a detachable, swingaway footrest, which makes storage easier. If you’re 5 feet four inches to 6 feet 2 inches tall and weigh 300 pounds or less, this combination rollator and wheelchair will work for you. The well-designed Lumex Hybrid effortlessly transitions from a rolling walker to a transport chair. With a weight of 22 pounds and a lightweight aluminum frame, this rollator/transport chair easily folds up and can be stored in a car trunk. The HybridLX offers firm hand grips and a full seat and backrest to keep you comfortable and safe. It has medium seat dimensions (18 inches width by 11 inches deep) and a seat height of 21.25 inches. Amazon reviewers praise the Lumex Hybrid for the way it makes turns and moves on level surfaces. Some users have had trouble pushing it uphill or on uneven ground. This rollator/transport chair has a three-year warranty on the frame and one year on other parts. A combination rollator and transport chair offers you the chance to walk, rest or sit while being pushed by a caregiver. Change the unit’s function depending on your mood and health. If you need to use a walker or wheelchair while recovering from an injury, or lack the energy to walk long distances, a rollator transport chair makes more sense for your needs than a standalone walker or transport chair. This compact combo chair can quickly switch between a rollator and a comfortable transport chair with no tools needed. The lightweight, pacific blue frame of the Hugo Mobility Switch rollator combo chair also folds up into a flat configuration for easier storage and transportation. 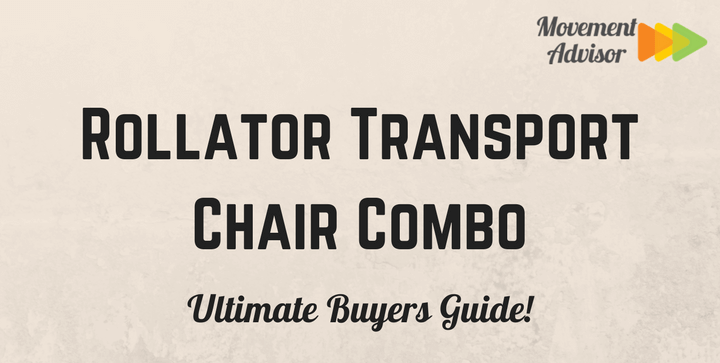 You can expect to rest and ride in comfort with this rollator combination model. A padded seat and backrest make the device a pleasure to sit in, while oversized 8” wheels offer stability and shock absorption for a smooth ride on any terrain. You can store your valuables in a handy nylon storage bag for safekeeping as you go about your day. Height adjustable handlebars allow you, a loved one, or a caretaker to easily push this device around town, whether you’re using it as a rollator or a transport chair. Ergonomic handles provide a comfortable grip, even for individuals suffering from arthritis or carpal tunnel system. This transport rollator from Roscoe Medical is not as easy to store as other combo chair models, but it is simple to assemble and use. The device transforms between rollator and transport chair simply by lowering a pair of fold-down footrests. The combo chair’s frame comes in burgundy or navy blue and boasts adjustable handles that can be set between 34.75” and 39”, depending on how tall you are. This makes it easy for anyone to push without sacrificing posture. The seat of this transport rollator is padded for optimal comfort, while its backrest is curved to eliminate any discomfort in the upper or lower back. The design also takes into account the comfort of a companion or caretaker, featuring a padded push handle when the device is being used as a transport chair. Find the best rollator transport chair by doing online research and talking to your doctor or therapist.